This book contains a variety of poems, many of which center around or are related to depression and anxiety. Some of my personal favorites include, "explaining depression to my mother a conversation", "the loneliest sweet potato", "minnows", and "follow-up a prayer / a spell". When I say the book has a variety of poems, I mean it in every sense of the phrase. Some are long, some are short, some are simple, some are complex, some are thought-provoking, and some seem kind of random. There are many poems that you kind of read over like "Okay, what in the world does that mean? I don't relate at all", but then there are some that strike you to the core. "explaining depression to my mother" and "the loneliest sweet potato" are two such poems. I read those and I was like, "Yes, yes, that's exactly how it feels." 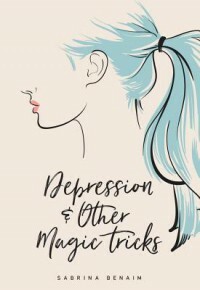 I definitely recommend this book for people living with depression and/or anxiety. I have both and many of Benaim's poetry really resonated with me. As I was reading them, I was nodding along, like "I've never been able to put it in those words, these are the words I was missing." Most of the poems fall into a stream of consciousness style, ignoring punctuation and capitalization so if that's not your cup of tea, you probably won't enjoy this book. While there are some definite misses in this collection, the hits Benaim does make fly right out of the park, earning this book 4-stars.